Received Hard Clam gill samples on “wet ice” in RNA Later from Rutgers. 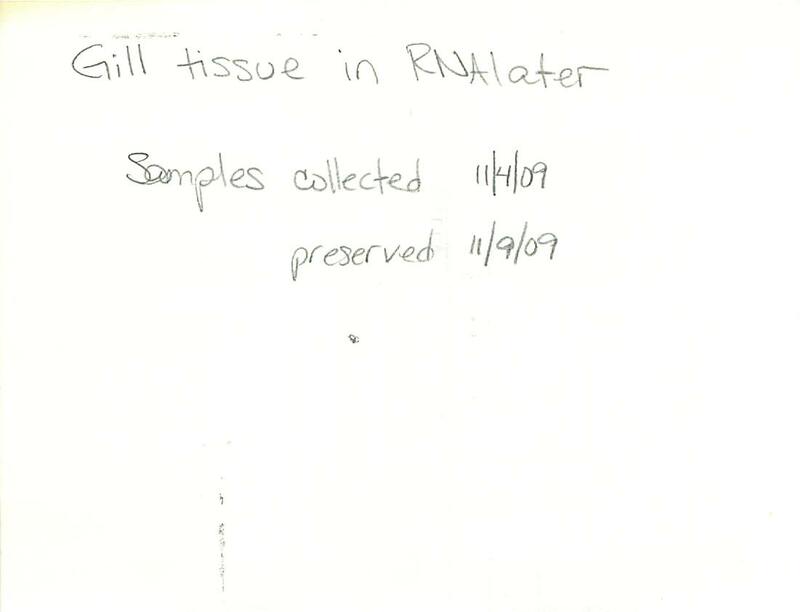 Samples were collected on 11/4/09 (clams held in refrigerator) and preserved (gill tissue collected) on 11/9/09 according to the paper included with the samples. Samples will be stored @ -80C until we are ready to process. This entry was posted in Miscellaneous and tagged gill, Hard clam, Mercenaria mercenaria, package, RNAlater, Rutgers on 13 November, 2009 by kubu4. This entry was posted in Miscellaneous and tagged bioanalyzer, gill, graph, Hard clam, Mercenaria mercenaria, mRNA, RNA quantification, SR01, SR02, SR03, SR04 on 16 March, 2009 by kubu4. Precipitation was continued from yesterday. Samples were resuspended in 25uL of The RNA Storage Solution (from PolyAPursit Kit) and spec’d. Samples were stored @ -80C in Sam’s RNA box. This entry was posted in Miscellaneous and tagged gill, Hard clam, Mercenaria mercenaria, Micro PolyA Purist, mRNA, NanoDrop1000, RNA quantification on 13 March, 2009 by kubu4. DNased RNA from earlier today was split into four equal parts (175uL = 39.8ug). Three will be used for mRNA isolation and the fourth will remain as total RNA. Three of these were precipitated according to Ambion PolyAPurist Protocol: 1/10 volume 5M ammonium acetate, 1uL glycogen and 2.5 volumes of 100% EtOH. Incubated @ -80C for 30 mins. One sample was processed with the Promega PolyA Tract kit. The remaining two samples were processed according to PolyAPurist Protocol. Of those two, one of the samples was processed a second time to evaluate the effectiveness of running a sample through the PolyAPurist Protocol twice. mRNA samples were precipitated O/N @ -20C according to the PolyAPurist Protocol. This entry was posted in Miscellaneous and tagged DNased RNA, gill, Hard clam, Mercenaria mercenaria, Micro PolyA Purist, mRNA, mRNA enrichment, PolyA Tract Kit on 12 March, 2009 by kubu4. 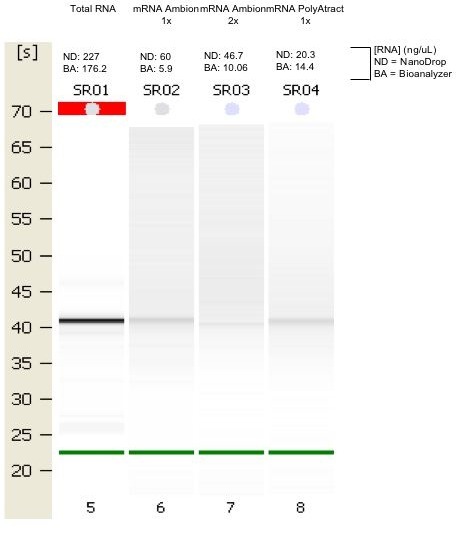 DNAsed RNA using Ambion Turbo DNA-free kit, following the rigorous procedure. Diluted total RNA to 0.2ug/uL (Vf = 720uL). Added 1uL DNase and incubated the tube @ 37C for 30mins. Added an additional 1uL DNase and continued incubated for 30mins. Added 0.2 volumes of DNase Inactivation Reagent (158.4uL) and incubated at RT for 10mins with periodic mixing. Pelleted inactivation reagent according to protocol and transferred supe (DNA-free RNA) to clean tube. This entry was posted in Miscellaneous and tagged DNase, EtOH precipitation, Hard clam, Mercenaria mercenaria, NanoDrop1000, RNA, RNA quantification, Turbo DNA-free on 12 March, 2009 by kubu4. Samples were pelleted and washed with 70% EtOH according to Ambion PolyA Purist protocol. Pellets were resuspended in 10uL of The RNA Storage Solution (included in the Ambion PolyA Purist Kit). Results: The gill mRNA looks great! Good yield and good ratios. Hemocyte mRNA looks kinda rough and a very low yield (which was to be expected). This entry was posted in Miscellaneous and tagged gill, Hard clam, hemocyte, Micro PolyA Purist, mRNA on 23 January, 2009 by kubu4.